This error doesn’t tell “exact” reason about login failed for user. SQL Server deliberately hides the nature of the authentication error and gives State 1. Here is what we would see in ERRORLOG is failed login auditing (option 1 and 3 in above image) is enabled. 2014-07-08 04:37:07.910 Logon Error: 18456, Severity: 14, State: 8. It is important to note that in earlier version of SQL Server (before SQL 2008), the error message was something like below. Notice that reason was not shown in earlier version of SQL in ERRORLOG. In those days, we used to keep a track of all states and their meanings but thankfully, I don’t need it any more. Here is the quick cheat sheet which I have saved. You can easily reproduce them. I have given meaningful login name. State 5: Incorrect login name provided. 2014-07-08 05:35:48.850 Logon Error: 18456, Severity: 14, State: 5. State 7: Account disabled AND incorrect password. 2014-07-08 05:41:30.390 Logon Error: 18456, Severity: 14, State: 7. 2014-07-08 05:41:22.950 Logon Error: 18470, Severity: 14, State: 1. 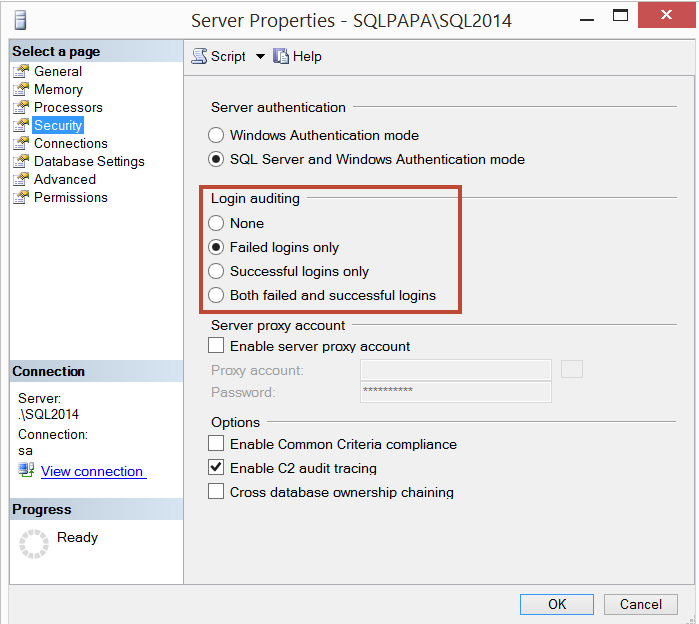 State 58: SQL account used to attempt to login on “Windows Only” authentication mode SQL instance. 2014-07-08 06:21:36.780 Logon Error: 18456, Severity: 14, State: 58. 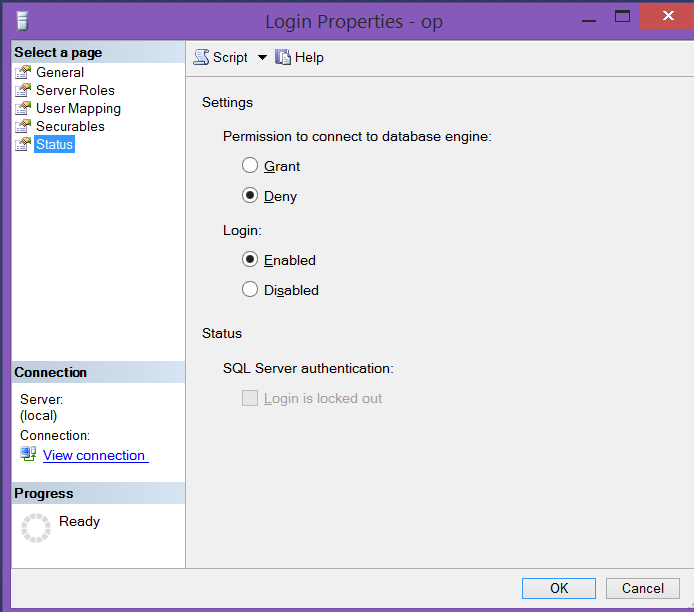 State 11: SQL login account getting deny permission via some group membership. 2014-07-08 06:21:36.780 Logon Error: 18456, Severity: 14, State: 11. State 12: Windows login account getting deny permission via some group membership or UAC. 2014-07-08 06:21:34.840 Logon Error: 18456, Severity: 14, State: 12. To solve state 11 and 12, it is important to find how we are getting deny permission for that account. In most of the cases, it might be due to UAC and this should work but it’s only for local connections. In few cases, we can run below query to find if any group has deny permission. If you find any other state, post in comment, I would enhance the blog further and add their cause.